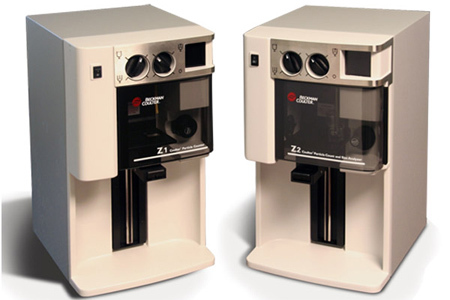 Both Z1 Single and Dual Threshold Models use the Coulter Principle (Electrical Sensing Zone Method) for counting cells or particles in the 1-120 micron size range. This technique provides accuracy, speed, versatility, and excellent precision; it is the accepted reference method for cell counting. Standard apertures are available in five sizes. In addition, for vey small sample volumes, ampoule insertable apertures may be used. The Z1 Dual Threshold Model counts cells or particles in three regions, equal to or above the operator selected lower size, above the upper size setting and between the two sizes. Excellent when cell numbers between a selected size range are required. Instrument of choice when working with numerous cell types, containing variable cell sizes, or platelets. The Z2 COULTER COUNTER is the latest addition to the Z™ Series COULTER COUNTER. In addition to reporting both count and concentration results, the Z2 adds the ability to provide size distribution of the cell population. The Z2, like the Z1™, uses the Coulter Principle (Electrical Sensing Zone Method) of counting and sizing of cells. This technique provides accuracy, speed, versatility and reproducibility. The Z2 displays the entire size distribution graph, or the size statistics and counts between user selectable areas of the graph. In addition, this instrument displays the cumulative count and the cumulative number % above and below a size determined by the cursor positioned on the graph. The Z2 has the ability to average counts and channelyzed data from a series of up to 10 consecutive analyses. The more cells counted and sized the greater the statistical confidence in the result and the smoother the shape of the averaged size distribution. The Beckman Coulter Windows based AccuComp® software package is available for quick and accurate calculation and presentation of sample data statistics from the Z2. Features of the AccuComp software include: size distribution statistics, data archiving, size trend analysis, result overlays, averages, graphs and tables, customizable reports, data import/export capability.